← Wednesday, Arrowmen, and more.. I know, I know, I am a day behind on updates….. but, I’ve been keeping very busy at camp, just like the scouts and the other adult leaders. Thursday’s weather was a bit cooler, even though it was hot here Wednesday it is nothing like what we are missing back home in Wheaton. It was a nice respite as a couple of scouters learned important lessons in hydration! The day began a slight threat of rain and overcast, but by afternoon, the skies had cleared and we had temperatures in the mid-eighties. Thursday brings the realization that we are almost done; and judging from the daily reports from the program areas and merit badges all our scouts are on track to come home with their rank advancement and completion of most of their merit badges. They’ll bring home many memories of camp, too. Whitewater rafting – Micro Trek went rafting and Mr. Cat and had a great day rafting – he came back to camp with a BIG smile! Trying to sink the submarine – Trevor won the prize with 4 out of 5 hits, way to go Trevor! Participating in the chess tournament – Eric finished second – way to go, you’ll get ‘em next year! Having fun at personal wellness playing in the dodge ball tournament. It is possible I left something out, and if I did, it is purely by accident! We’ve had full days and full evenings. I had planned (hoped, too) to get back to camp and work last night but instead, I played and watched the scouts have fun. When 9:00 rolled around and the activities closed, most of the scouts headed back to camp. However, a few scouts stayed and walked over to the Trading Post. I followed them; mainly to check on the scouts, but also because I wanted to enjoy a bowl of ice cream, and I did – chocolate cookie surprise and peanut butter – it was buy three scoops and get a fourth free and for fifty cents a scoop, it was a deal! I enjoyed my sweet treat, but I really enjoyed sitting and talking to the five scouts who’d stayed at camp. I listened as they talked about the best year at camp – there was a mixture of scouts a few who’d been at camp four years and a scout who was here for the first time. It was great listening as they took turns sharing and listening and the older scouts reached out to younger scout and got him engaged in the conversation. They all said they’d be back at Tesomas next year. When the trading post closed at ten, we started back to camp on the road. I had walked and the scouts pushed their bikes and we walked together, still talking, listening, laughing, and sharing. The crescent moon beamed across the clear sky and lit up the forest as walked, it was magical. There was a campfire going when we returned and I stayed up for few more minutes before we doused the flames and called it a complete day. We’ve had five wonderful days at camp, so far. I have finished each post with the tag – ‘Today is gonna be a great day and tomorrow could possibly be a million and six times better,” or something similar. I am not certain about the mathematical possibilities, but each day has been better than day before. Today is going to be great day, tomorrow we leave for home and I know they’ll be sleepy campers, maybe even a bit smelly, too. Nevertheless, they’ll be dreaming of camp and getting back here next year. Making the Days Count, one day a time, one final full day at camp! 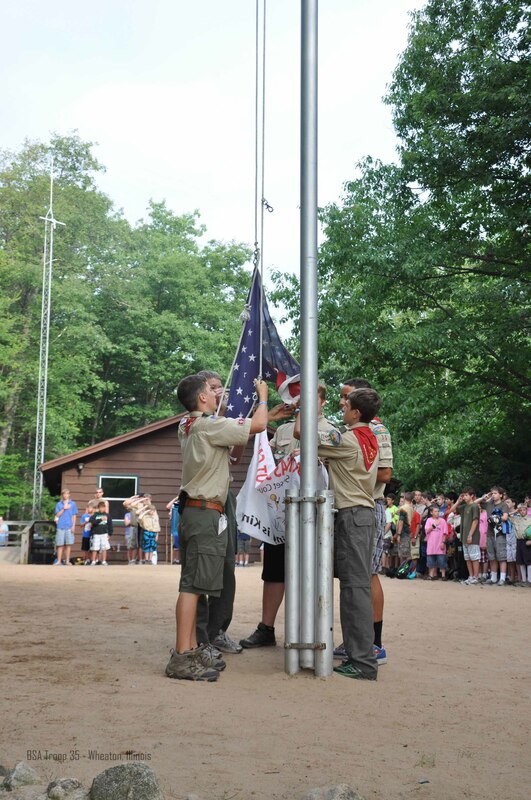 This entry was posted in Camping, Leadership, Recruiting, Scout Values, Scouting skills. Bookmark the permalink.